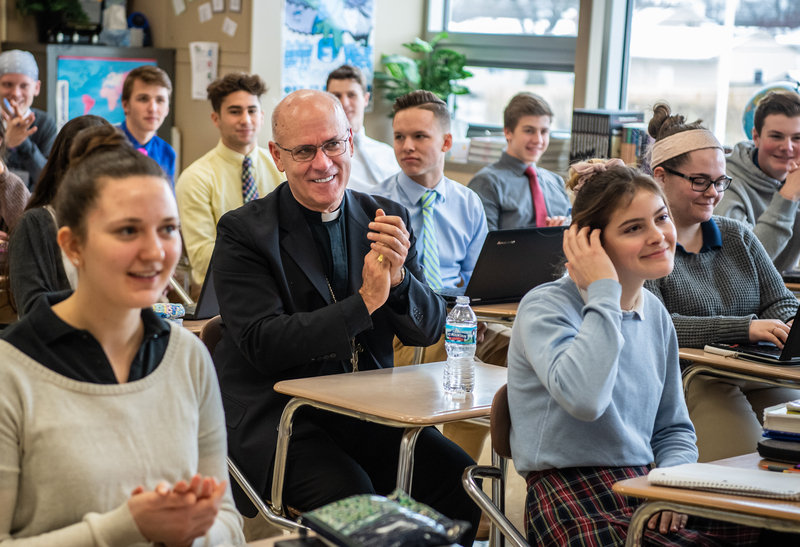 On Thursday, Jan. 10, the Most Reverend Kevin C. Rhoades, Bishop of Fort Wayne-South Bend, celebrated Mass at Bishop Dwenger High School, Fort Wayne — the first of his pastoral visits to diocesan Catholic schools in the new year. Bishop Rhoades began his homily by discussing the First Letter of John, which talks about the Incarnation. 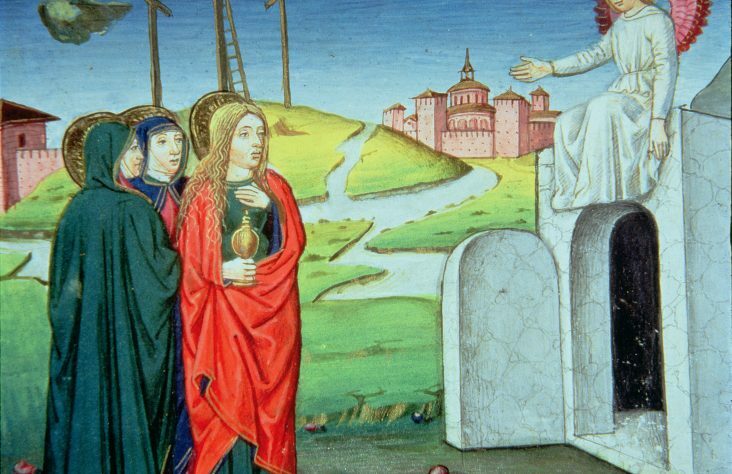 “The first letter of John is deeply relevant for our times. 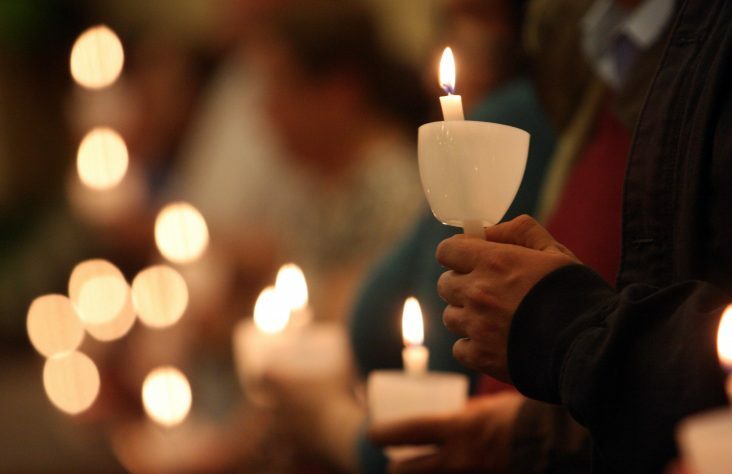 It teaches us how important it is to know and confess the heart of our faith. The heart of our faith is the truth that God became man, that the Word became flesh. Jesus is the Son of God who has truly come in the flesh and has redeemed us by His sacrifice on the cross,” he said. Bishop Kevin C. Rhoades celebrates the eucharistic liturgy at Bishop Dwenger High School Jan. 10. 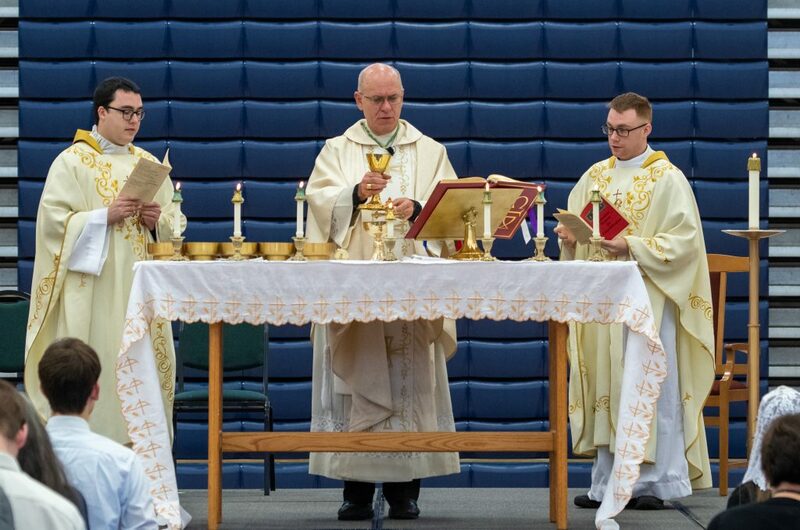 Concelebrating the Mass are school chaplains Father David Huneck, left, and Father Jay Horning. 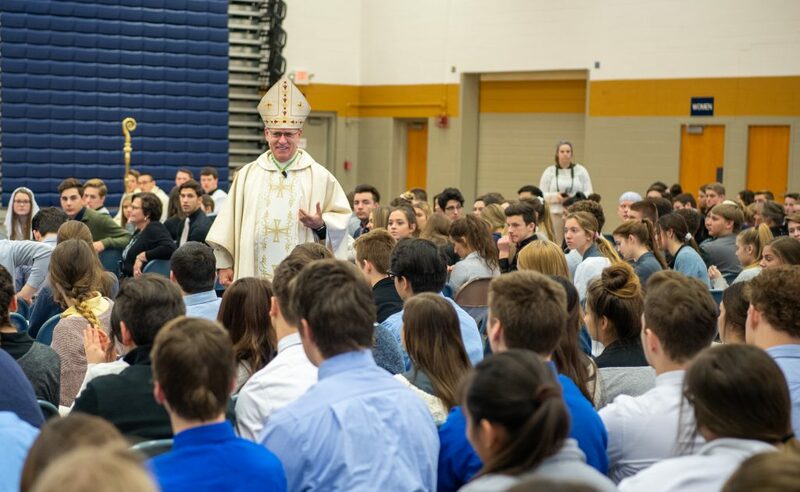 Following the celebration of the Mass, Bishop Rhoades took a moment to address the recent achievements and successes with which the high school has been blessed. He thanked the recently ordained chaplains of the school, Father Jay Horning and Father David Huneck, for their strong spiritual leadership. Next, he congratulated the Saints football program that won a state championship in a record-setting quadruple overtime at Lucas Oil Stadium in Indianapolis in November, inviting the team to a pizza party in their honor at his office. 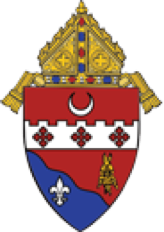 The bishop also congratulated the school on being chosen to lead the 46th annual National March for Life in Washington, D.C., later this month. While he expressed his disappointment that he would be unable to lead his flock into battle for the legal protection of the unborn at the national march this year, he explained that during that time, he would be accompanying a handful of Bishop Dwenger students and other young people on a weeklong pilgrimage to Panama for World Youth Day. Wanting some input from the student body, Bishop Rhoades opened the floor to questions of any nature. One student asked what the bishop’s middle initial, “C,” stands for. He answered that “C” stands for “Carl,” after his grandfather. He explained that “Carl” is actually short for his grandfather’s full Greek name. Another student asked what the bishop’s favorite Christmas present was. He responded that his favorite gift, other than the abundance of clothes he received this Christmas, was a commentary on the Old Testament. He added that his favorite part is either the book of Genesis or the book of Exodus. He also said that regarding several gift cards he received, he was especially excited about his Starbucks card — which resonated with the students, many of whom are regulars at the coffee chain. 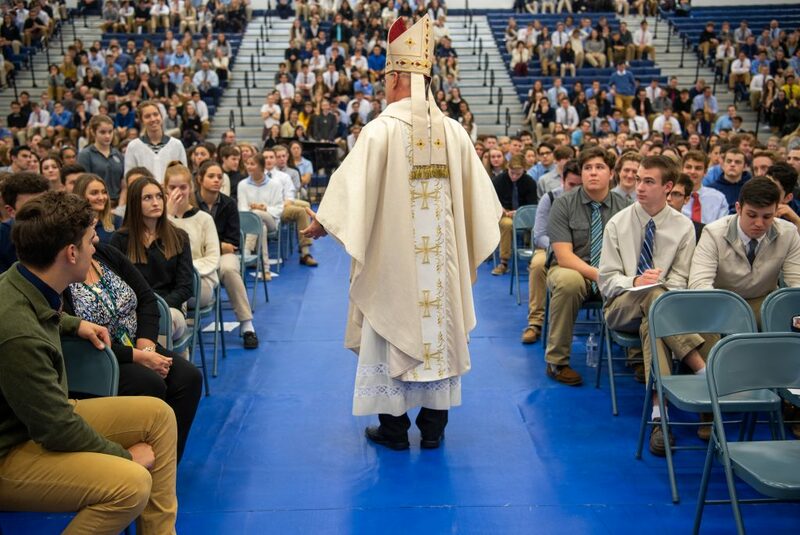 A few students had some questions about more pressing issues, such as “How binding are the pope’s statements and opinions on governments?” and “What is the Church’s stance on gun control?” He informed the students about the Church’s official position on these topics with understanding. 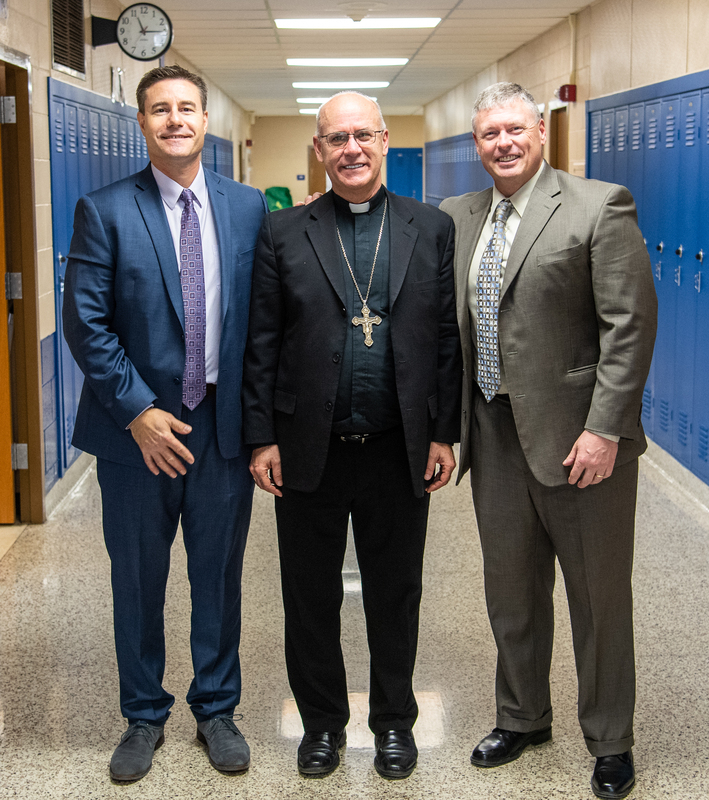 Bishop Dwenger principal Jason Schiffli, left, and Jason Garrett, campus minister and football coach, welcomed Bishop Rhoades to the school. Following the final blessing, Bishop Dwenger High School principal Jason Schiffli took a moment to announce band director Don Cochran as the Light of Learning award winner. Cochran took the moment to thank the student body, and to remind everyone that someone in their life cares about them. 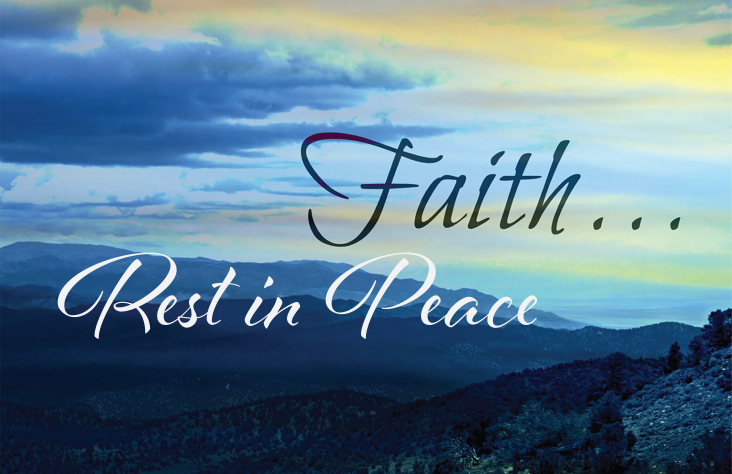 After having lost a student earlier in his career, Cochran said he made it a point to let each student he encountered know that they are loved. He reminds them of this love before they leave the classroom each day. While Cochran is only in his third year teaching at the high school, Schiffli and several members of the student body commented that he has had a positive impact on their lives. The students and Bishop Rhoades answer questions in teacher Carrie Bleeke’s psychology class. Throughout the rest of the morning Bishop Rhoades visited various classrooms. He had Spanish-language conversations with a number of language students and sat in on an Advanced Placement Psychology class taught by Carrie Bleeke. In that class he walked down a row of desks and sat among the students, telling his desk neighbors that he had not taken a psychology class in a long time. 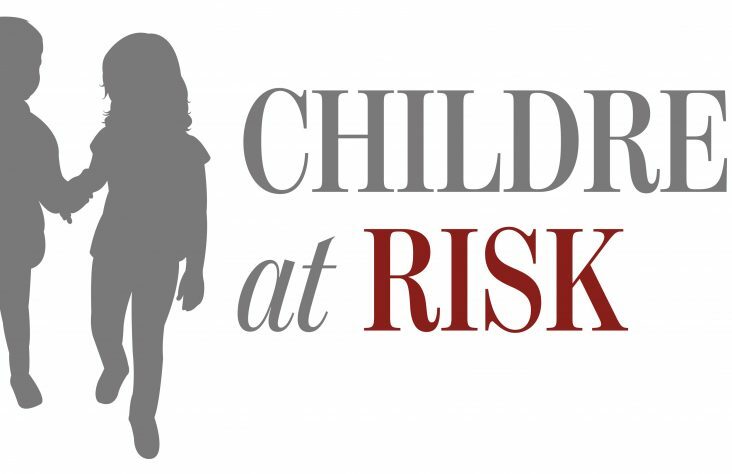 The students had been discussing cognitive development, they said, which is simply defined as the “development of thought processes and problem solving.” After writing the four stages of development on the board, Bleeke brought out a bag of toys. One by one, she described and demonstrated the operation of the toy, and students raised their hands to identify the toy with a stage of cognitive development. After the demonstration, Bishop Rhoades happily remarked that he had been able to answer a handful of questions correctly near the end. The bishop met with several teachers from the theology department, as well as the entire staff following the conclusion of the school day.